ZPrinting is a 3D printing technology developed by MIT in 1995. ZPrinting uses powder and liquid binding material to create 3D parts. ZPrinting refers to the Z axis that gives depth to the X and Y axis. The Z axis is typically vertical while the X and Y axis are horizontal. 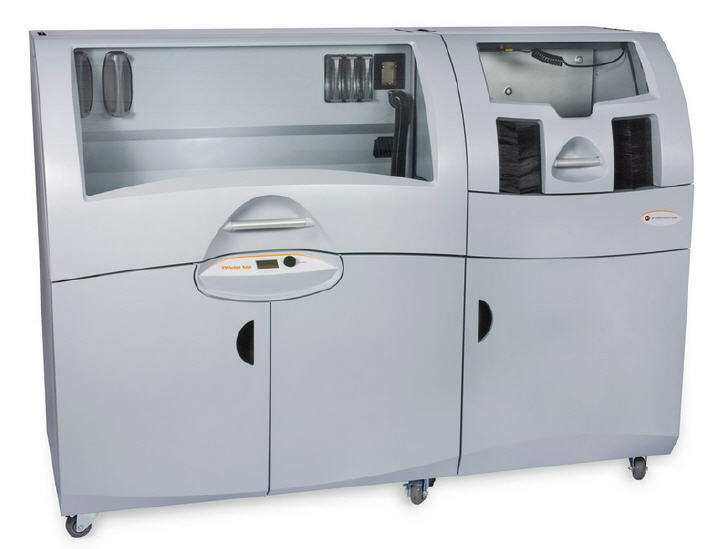 The Zprinter is developed by Z Corporation, which was acquired by 3D systems in 2012. In 3D printing, ZPrinting prints parts from several cross sections. First, the user creates a model in 3D modeling software and saves it as an STL file. The STL file is sent to the 3D printer’s interfacing software that slices the model into sections and determines how the layers will be printed. The model is sent to the 3D printer where a layer of powder is deposited. The print head moves across the powder and deposits liquid binding material in the shape of the part. This liquid binds the powder together. Another layer of powder is spread on top and the print head deposits liquid binder. The process repeats until the part is complete. The part is removed from the powder and cleaned. The unused powder can be reused.